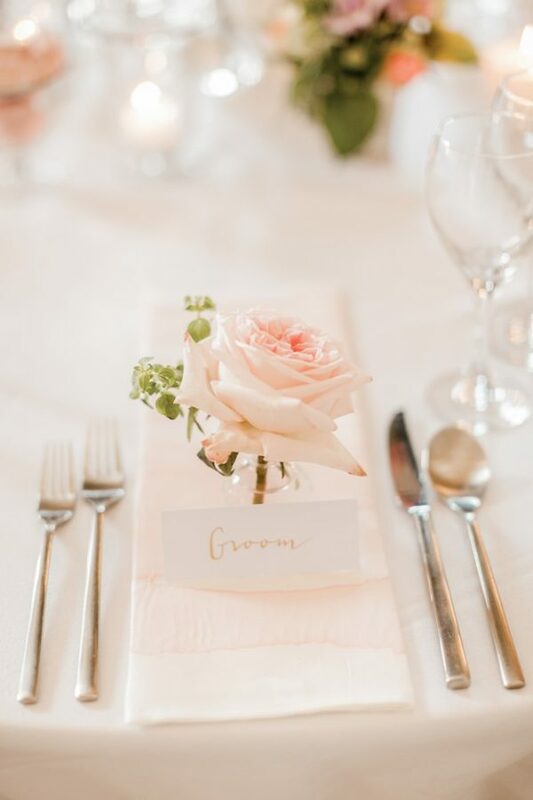 When it comes to your reception tables, never underestimate the impact your wedding place settings and napkin dressing can have! 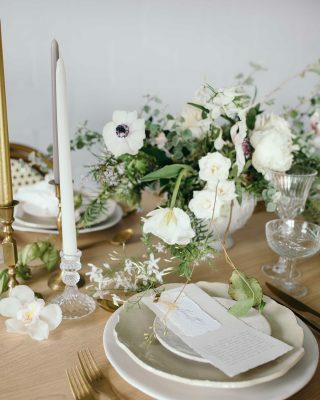 How you style your wedding place settings and napkins will instantly set the scene for your guest tables, and it’ll help pull your theme together. Stuck for ideas? Don’t fret, we’ve done all of the hard work for you! 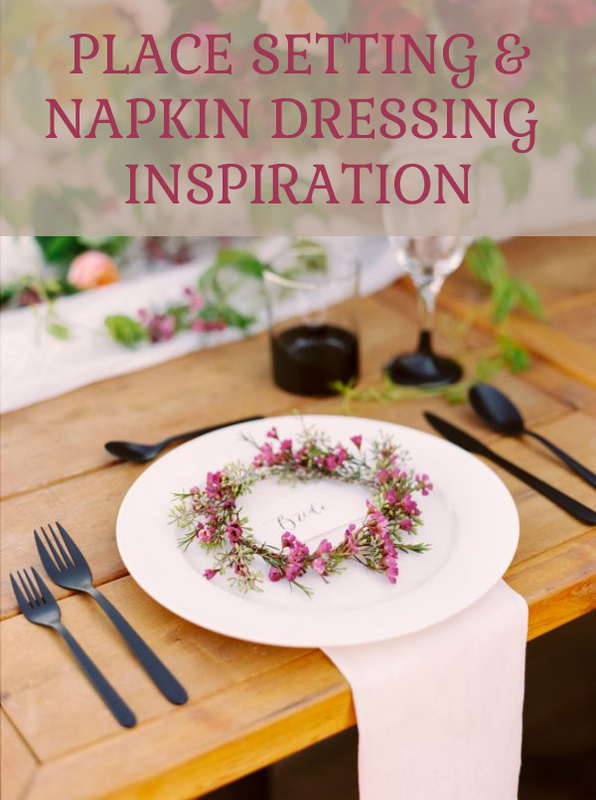 Today we’re sharing with you inspiration for elegant wedding place settings and napkin dressing. Sometimes a single flower is all you need to add elegance to your wedding place settings. A rose works perfectly for a country garden or vintage wedding theme. 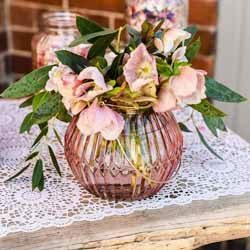 If you’re planning a colourful Summer wedding, you could use a cut lisianthus or rose head. 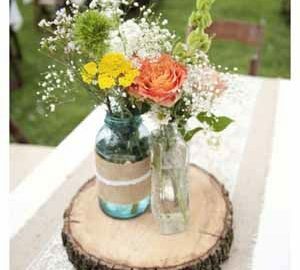 Tuck it in the napkin or place in a small bud vase to avoid it wilting. Green wreaths are being used throughout wedding venues as backdrops or hanging installations. 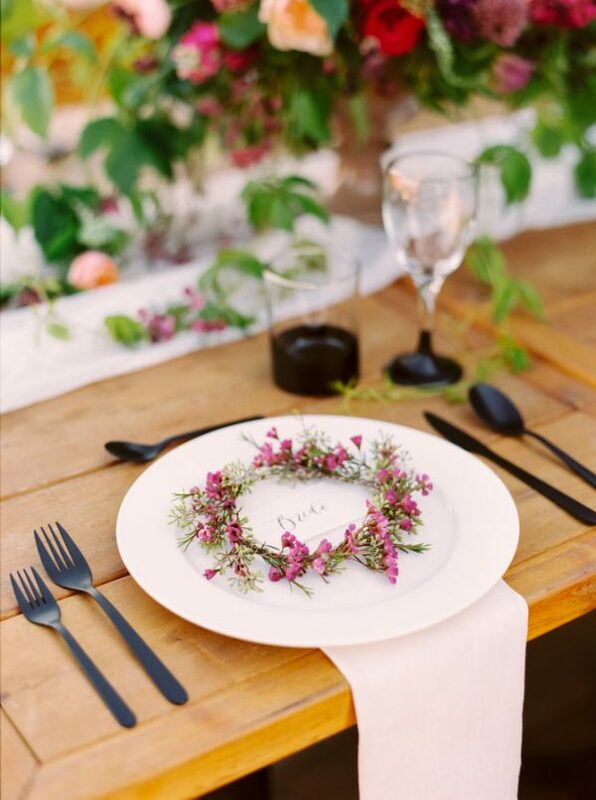 However, we are swooning over the thought of using a small floral wreath to add some prettiness to your place settings. 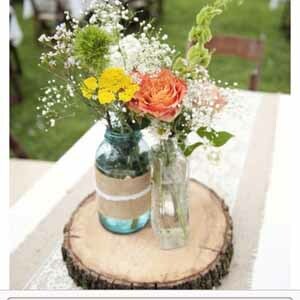 You could create the same style throughout your tables, or create a different design for each guests. 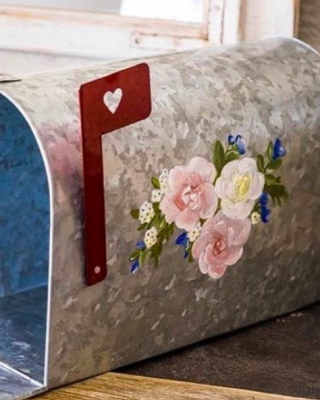 These are so gorgeous that they could easily double up as your wedding favours too. 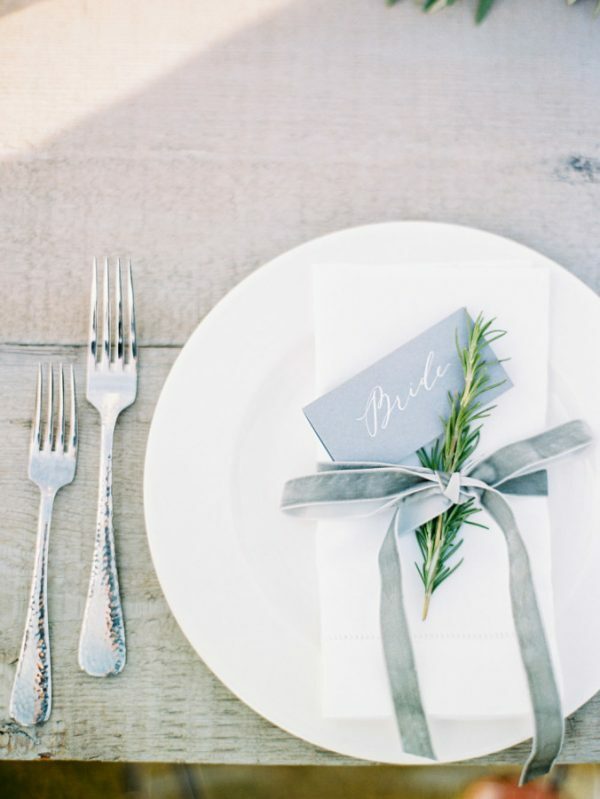 A simple ribbon can have huge impact on your wedding place settings and napkin dressing. 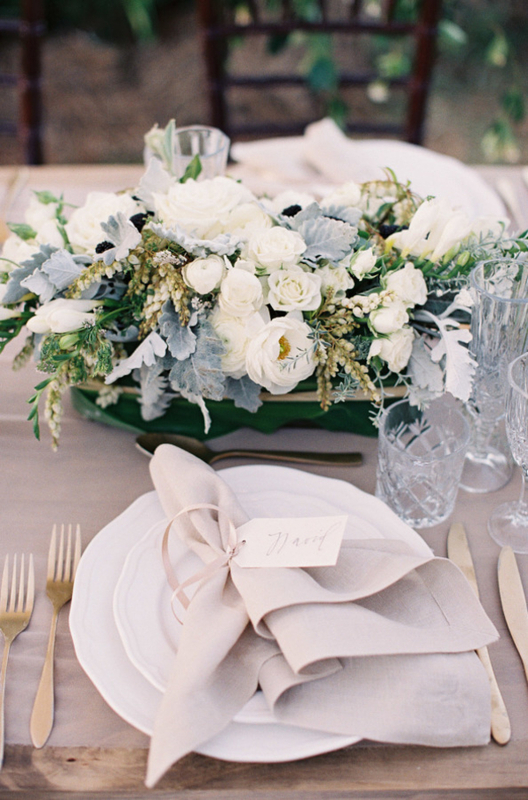 A sprig of lavender or greenery will look lovely tied to your napkin with a luxurious velvet ribbon. Alternatively, why not tie your cutlery together with a silk ribbon? You can then place them in the middle of the plates and your wedding place settings will look stunning. 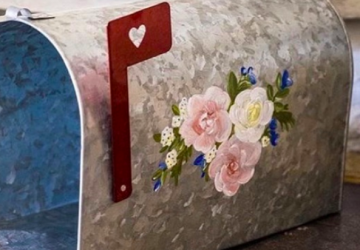 Using ribbon is also a purse-friendly idea that looks beautiful, without breaking the bank! 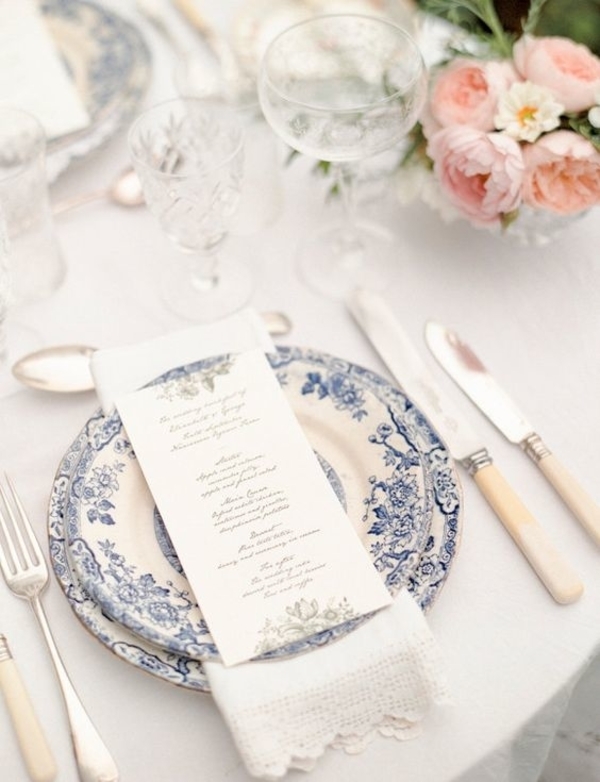 For truly elegant wedding place settings, consider using vintage china or plates adorned with pretty patterns. A nod towards an Alice in Wonderland or English garden wedding theme, these statement plates will look divine. 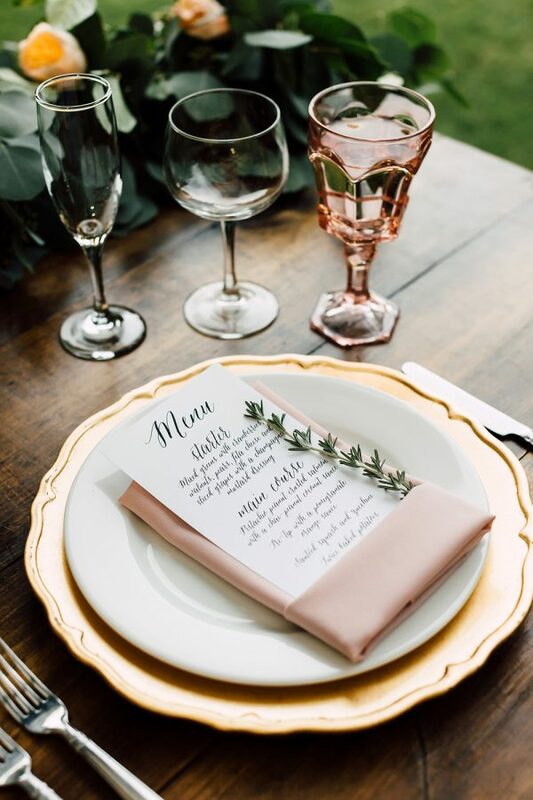 Blush pink napkins are a super sweet alternative to simple white napkins, and they’ll instantly add elegance to your place settings. Who says you have to stick to white plates? 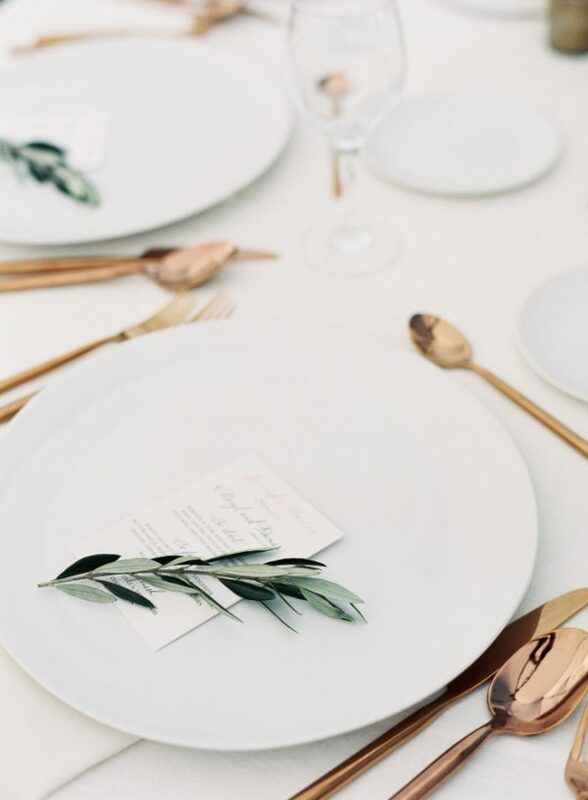 Add a touch of glitz and glamour to your place settings by opting for gold charger plates, or plates with metallic edging. 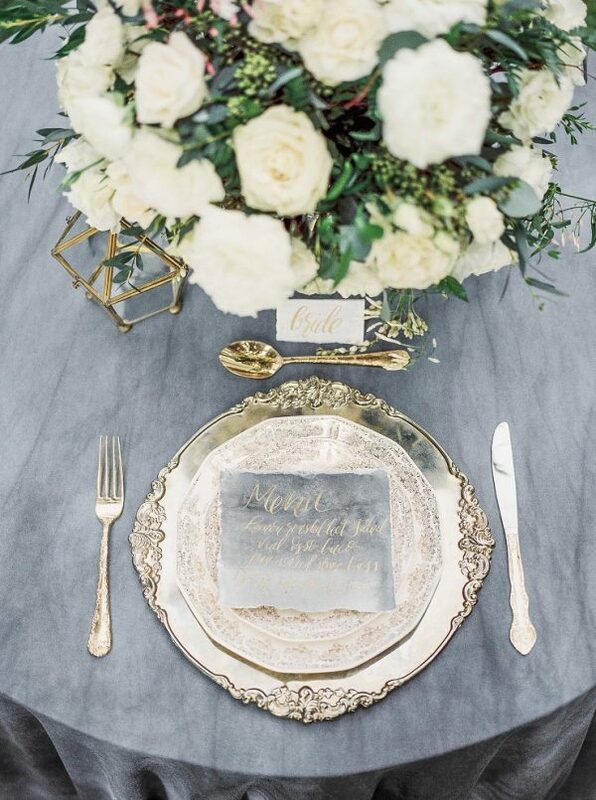 Our gold antique trays look stunning as part of your place settings, and your guests will feel luxurious dining at your reception. Whether it’s your wedding jewellery, decor or cake – metallics are big news for weddings this year. It doesn’t stop at your wedding place settings either! 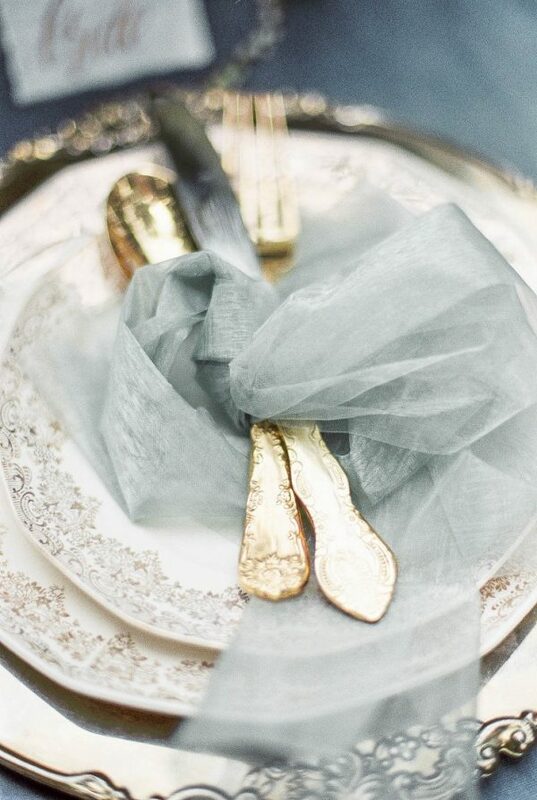 Gilded cutlery is the epitome of luxury and style, and they’re a must-have addition to your wedding tables. 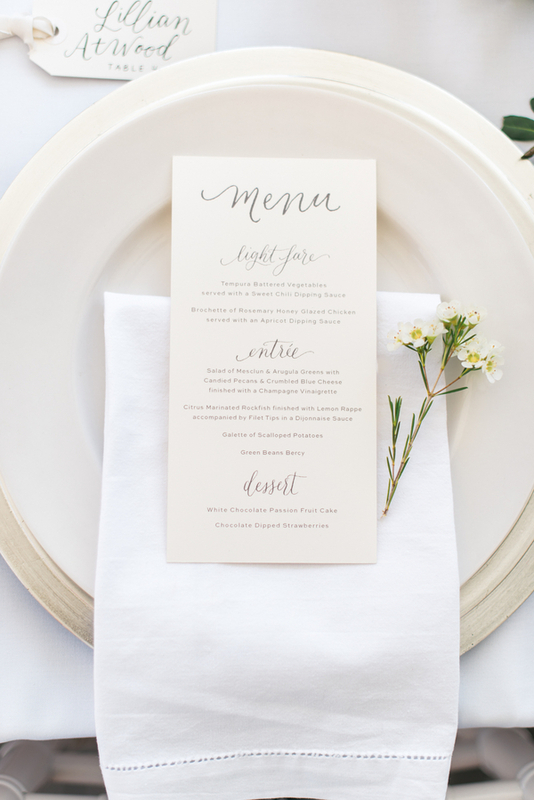 An all-white wedding theme is guaranteed to exude elegance, and your wedding place settings are certainly no exception. 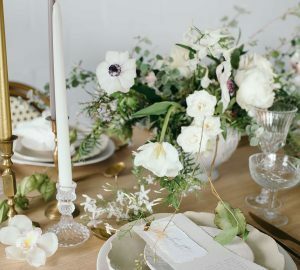 From crisp white napkins to white plates adorned with ivory blooms, this is the perfect style if you’re day-dreaming about simple and stylish place settings. 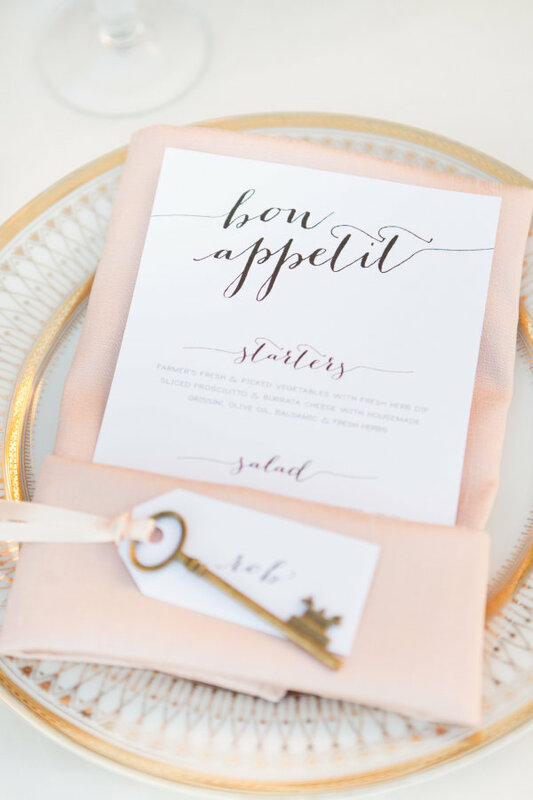 For a sprinkling of romance, we suggest adding an antique metal key to your wedding place settings. Tie to your napkin with a delicate ribbon and offer them to your guests as a wedding favour. Keys can represent a number of things at a wedding. ‘You’re the key to my heart’ or ‘Unlocking our future’ our both lovely quotes to use. You could handwrite them on a little luggage tag and attach them to the key. 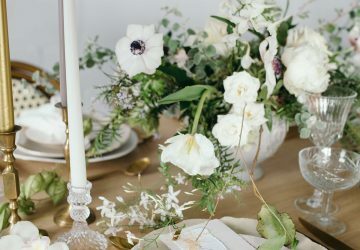 Why not go all out and combine all of these ideas to create seriously elegant wedding place settings. 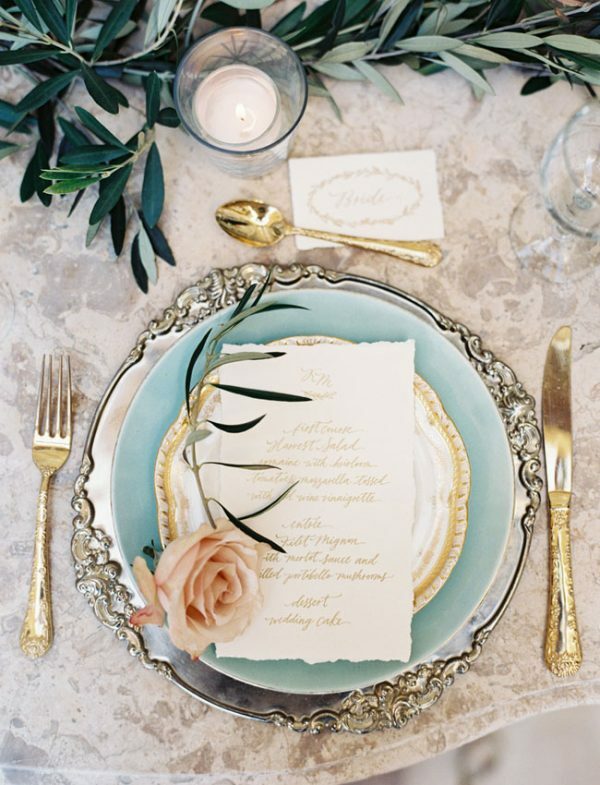 From gilded cutlery to golden trays adorned with blooms, this style of place setting will look show-stopping.